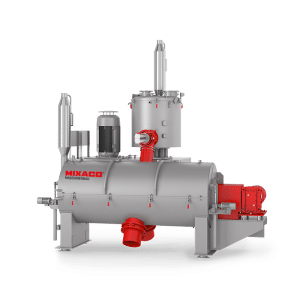 MIXACO in the Chemical Industry. The Right Mixture for Every Product. The huge and diverse range of industrial chemical products calls for customized mixing process solutions. Different product characteristics and recipes demand individual handling and mixing processes. Our holistic view of the requirements of the chemicals industry ensures that the right processes are selected for each individual case. 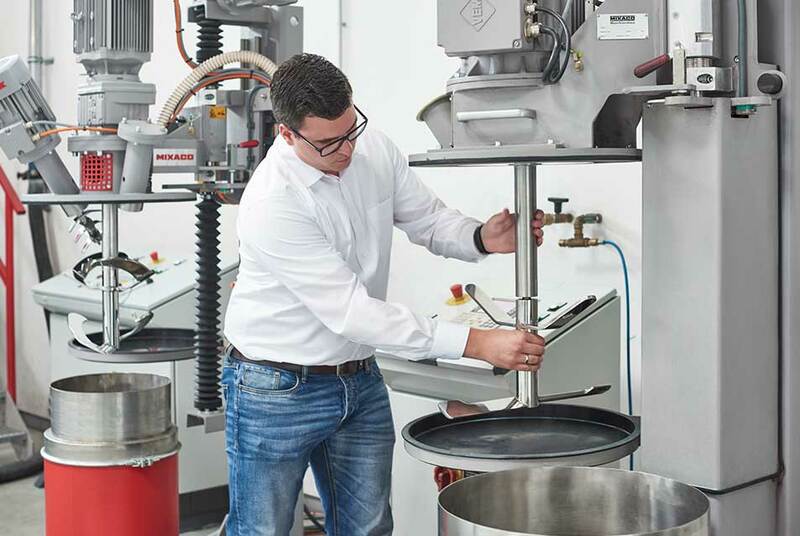 We work with our customers to find the right process for optimum mixing results. 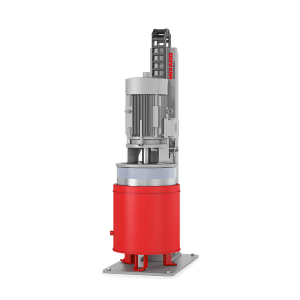 Whether homogenization, dispersion, preparation or coating is required, mixing parameters are individually designed for the respective product—with all of the machines in our Innovation Centers in constant readiness. For example, the introduction of additives or pigments can be defined with extreme precision so as to ensure reliability and process safety later in day-to-day industrial use. 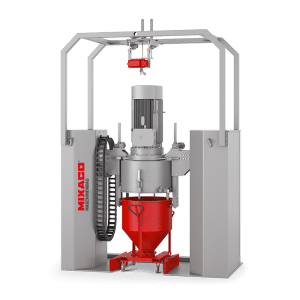 Mixing parameters and suitable tooling for applications such as compounding are also determined here, with factors such as dust-free operation and seamless cleanliness throughout the production workflow also being taken into account. Another decisive factor besides outstanding mixing results is the ability to change recipes quickly. MIXACO has been an innovation leader in this field for more than 50 years. 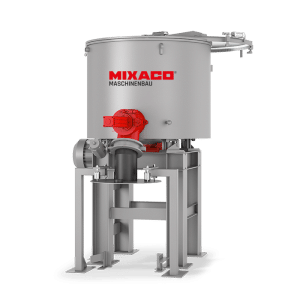 The Container Mixer features a mixing container that is also a transport container. After mixing is completed, the finished mixture is simply rolled to the following work station for the next processing step. 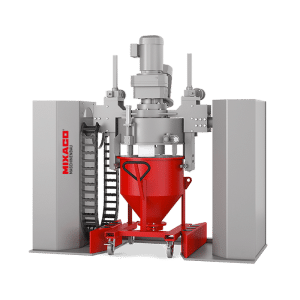 Since it is only necessary to clean the mixing head before the next recipe change, this solution makes the overall production process easier and faster. 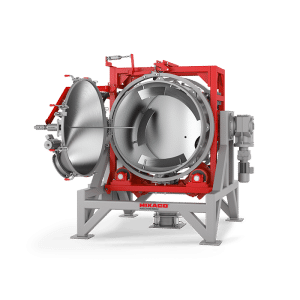 More than fifty years of experience in process engineering and the profound know-how of our experts ensure that our customers benefit from faster custom-designed results and products they can take to market earlier. At the same time, we work closely with our customers on the continuous optimization of existing processes related to the mixing requirements of the chemicals industry. We’ve found a partner who really understands our business. MIXACO helps us to achieve excellent results in terms of product quality and manufacturing efficiency right from the development stage. 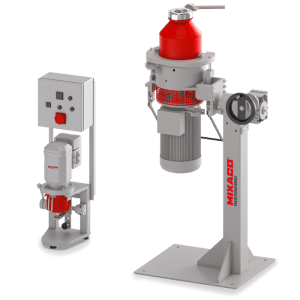 MIXACO has a profound understanding of the chemical product mixing business. We have an expert command of all procedures for all common procedures in the industry. If you don’t have the right solution for a new idea, we will help you to design one straight away. We supply mixing systems for the development and production of chemical compounds in numerous dimensions and batch sizes. 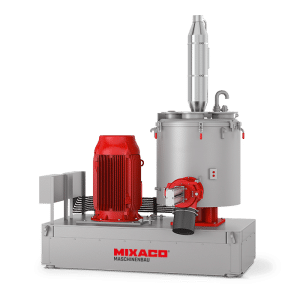 In this market, leading supplier MIXACO delivers maximum efficiency, superlative mixing quality, optimum machine availability and a wealth of unique know-how for the complex individual requirements of the chemicals industry. We have straight answers for your individual requirements. To submit your inquiry without obligation, simply fill in our contact form. Your encoded data will be transmitted securely and treated in complete confidence.